Now Comes Packed with ERC20 Contract! 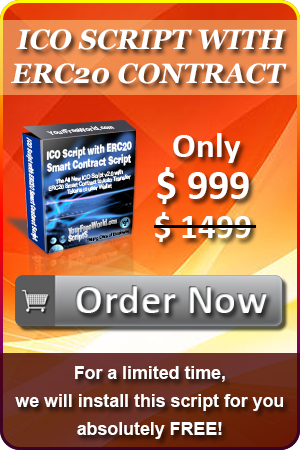 To all our beloved clients, who appraised our previous ICO Script that we launched a little while ago, we come up with another great update that offers cutting-edge features of ERC20 contract. As you all might know, cryptocurrencies such as Ethereum, are rapidly growing and advancing, and becoming a better, near perfect digital currency that can be used for almost anything. With such advancements, it is essential for developers like us, who devote their time to create cryptocurrency based scripts, to remain up to date with such updates and embed them in our scripts. This is what we have done with this newly updated ICO Script. With this script, you now have the powerful benefits of ERC20 Contract, which allows anyone who purchases the tokens, to instantly credit them onto their account. This was not possible earlier but thanks to ingenious programmers, this dream has become a true reality. Set Up Unlimited Levels, Deep Level Bonuses, and Much More! With this new update, you can earn better profits and returns on investment because it allows a much simpler, and faster user experience than any other script out there. So, don’t wait further. Order this ICO Script now, and start receiving funds that you wanted to have, today!